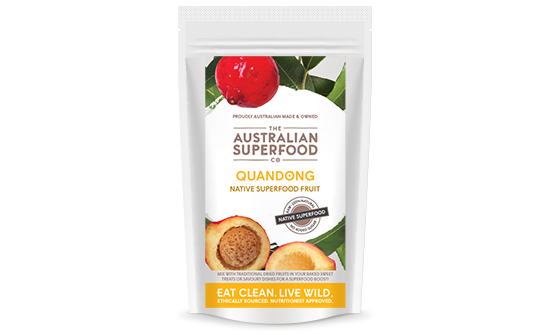 Traditionally a significant food source for Indigenous Australians, the Quandong or ‘Wild Peach’, features heavily in Aboriginal mythology across the desert regions of Australia. These glossy, bright, crimson fruits have been a staple for the Pitjabtjara people for over 50,000 years. Whilst the Quandong was considered a wonderful substitute for meat, the leaves and bark of its tree were used for ceremonial and medicinal purposes. On hunting trips, Pitjabtjara men would seek out Quandong trees, consume the fresh fruits for energy and fill their coolamon wiris (dishes) with a supply of Quandong that they could dry and store for use when meat was in short supply. Made up of 25% protein and 70% complex oils, the Quandong kernels would also be used to create powerful antibacterial and anti-inflammatory pastes. 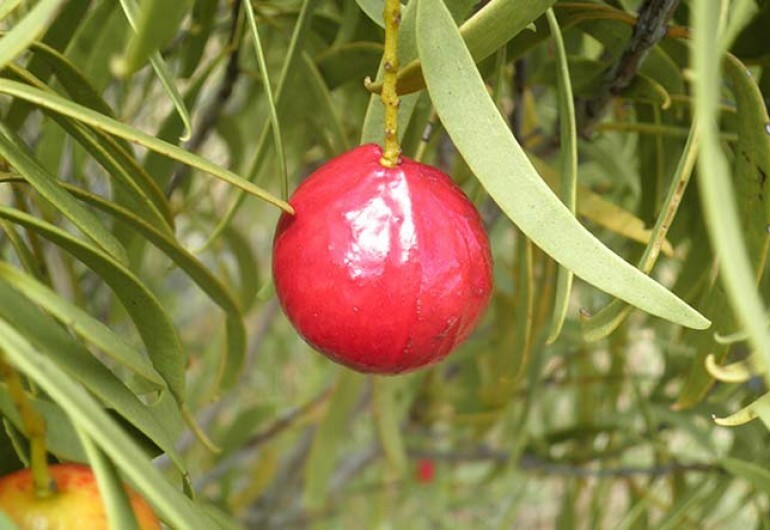 To this day, the Quandong is valued equally as a food and as a medicine in treating skin conditions and rheumatism. This large, tantalizing fruit is so loved by desert tribes that whether in season or not, it is hard to find a Quandong tree that does not have a makeshift ladder propped up against it to aid fruit collection by adoring fans! Contains twice the Vitamin C of an orange. 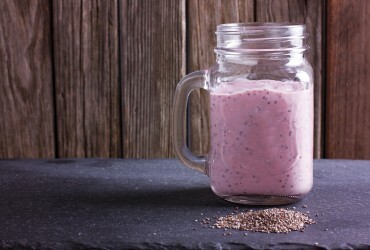 A wonderful source of Vitamin E, folate, magnesium and calcium. A valuable vegetarian/vegan source of iron and zinc. 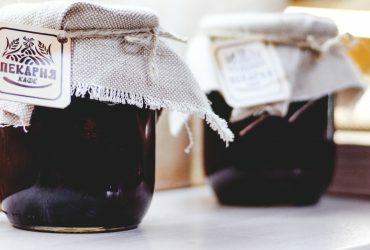 A rich source of phenolic-based antioxidants which boost the immune system, reduce inflammation and protect against a number of diseases including cancer, cardiovascular disease and Alzheimer’s disease. 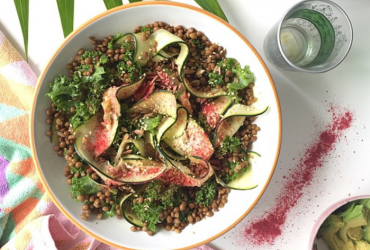 The kernel contains a range of complex oils and is recognised for its antibacterial and anti-inflammatory qualities. Contains Rutin, a strong antioxidant that can reduce the proliferation of free radicals. Rutin works with Vitamin C to strengthen capillaries, reduce dark circles under the eyes and strengthen the skin from the affects of aging. A sweet taste with a balancing slightly sour and salty aftertaste and a mild aroma of dry lentils with some earthy fermented touches. The ripe, sweet, beautifully textured flesh of the Quandong is eaten fresh, although it can also be dried and stored for future use. 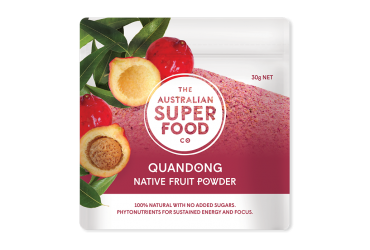 For convenience, dried Quandong can be reconstituted and used in a range of tantalizing desserts. 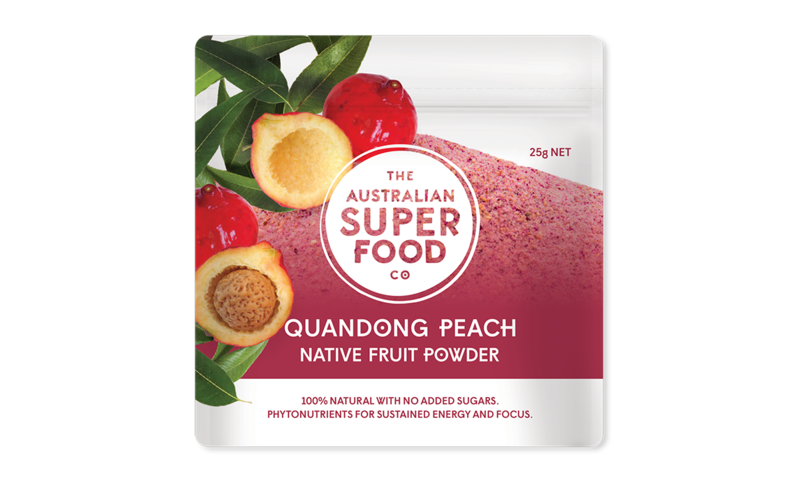 At The Australian Superfood Co, we frequently develop sweet treats that are both nutritious and scrumptious. 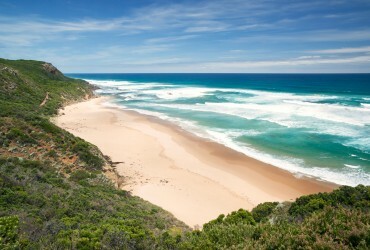 Check out our blog for the latest updates! 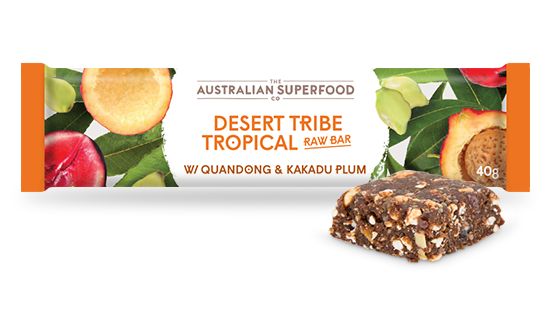 Taste the delectable Quandong in the Desert Tribe Tropical Raw Bar or add Freeze Dried Quandong or Air Dried Quandong in your cooking to impart a delicious, peachy flavour. "Made up of 25% protein and 70% complex oils, the Quandong kernels would also be used to create powerful antibacterial and anti-inflammatory pastes."